Online ad views are now growing faster than video views according to Freewheel. Live viewing is a major driver, though sports influence is beginning to fade. In Freewheel’s Q4 2017 report, the company reported growth in video views outpacing growth in ad views. Video views increased by 26% while ad viewers 22%. In 2018, ad view growth increased to 27% while the increase in video views dropped to 25%. According to Leichtman Research, the penetration of vMVPDs increased by 118% between June 2017 and June 2018, to reach 4.5 million households in the US. The rapid growth in free ad-supported online video is exemplified best by the performance of The Roku Channel. Since the launch of the ad-supported on-demand service The Roku Channel late in 2017, it has rapidly ascended into the top 5 channels on the Roku box. Such robust growth is reflected in the average revenue per unit (ARPU) earned each quarter by the company. 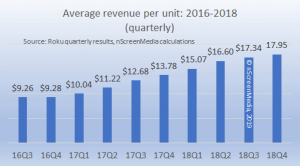 Roku reports that ARPU increased by 30% during 2018, to reach $17.95 per quarter. 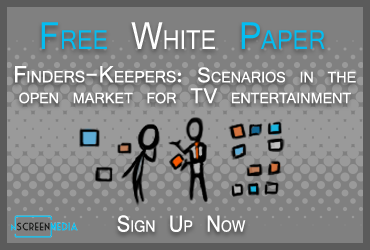 In the free report Secret Life of Streamers II from 2018, nScreenMedia found that the connected TV dominated the consumption of episodic TV content. To understand the magnitude of the shift toward the connected TV, consider the hours between 9 and 10 PM, the heart of primetime viewing. In 2016, the PC accounted for 39% of TV show plays and the connected TV for 36%. One year later, the PC’s share fell to 19% while the connected TV’s share has ballooned to almost half of all plays. The PC has fallen so far out of favor during primetime that the tablet eclipses it. 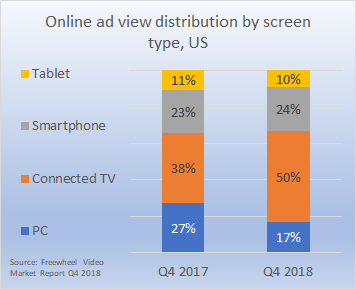 Freewheel’s data shows the trend toward connected TV, and away from the PC, continues. The connected TV has increased the share of online ad views from 38% to 50%. The PC’s share has shrunk from 27% to 17%. The tablet and smartphone shares of ad views have remained nearly unchanged. Live viewing continues to expand online. A third of ad views were seen in live streams in 2018, up 86% from 2017. However, sports influence on live ad views waned in 2018. In Q4 2017, sports drove 77% of live ad views, but its share of views fell to 57% in Q4 2018. Again, the influence of vMVPDs could be a big reason for the shift. With the number of subscribers to the services more than doubling in the last year, many more viewers have taken their live linear viewing online. As well, viewing of Internet-native linear services such as Pluto TV could be helping boost the share of live ad views in entertainment and news. Pluto TV says it now has over 12 million active viewers mostly in the US. Ad view growth exceeded video view growth in 2018. New inventory from the massive growth in the vMVPD and AVOD markets are likely responsible. Live and connected TV viewing is helping fuel the growth of online ad views.